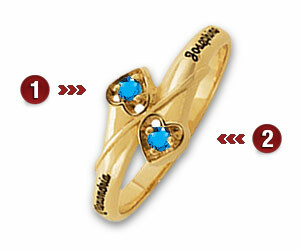 The 14kt yellow gold Delightful Hearts promise ring is set with two simulated gemstones. Engrave two names, up to 10 characters each. Each round gemstone is 2mm in diameter (equivalent to .04 ct). Import.